The 14th Festival de Casteliers, March 6 to 10, 2019 will remain etched in our hearts and in our collective memory. With its venues filled with happy spectators (over 95% capacity! ), the festival brought together young and old, professionals as well as enthusiastic amateurs. Together they experienced some of the very best original contemporary puppet theatre from France, the United States, Canada and Québec. Whether on the main stage or in a more intimate setting, puppetry art revealed its infinite bounty, skill, tenderness, wisdom and finesse. This important focus on French puppet and object theatre in North America was spearheaded and backed by the Institut français and the French Consulate General in Québec City. Our French cousin’s support enabled us to host a large delegation of presenters and young artists from Brittany, as well as to present long-awaited landmark works from France. 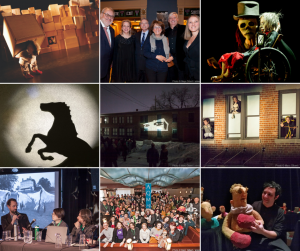 Over 200 people attended the official inauguration of the Maison internationale des arts de la marionnette (MIAM – International House of Puppetry Arts), where speeches, a shadow and light performance, and quirky humanettes stoked an enthusiastic crowd, visibly proud of this unique cultural infrastructure, a Canadian and Montréal first! The festival hosted a large delegation of 32 foreign presenters. They met with local theatre company delegates and got a very good feel for Québec’s professional puppetry scene. Festival de Casteliers is delighted that it attracts, year in year out, an increasing number of our peers to celebrate the 11th art over a few days in March. Casteliers wishes to warmly thank participating puppeteers, technical staff, partners and sponsors, as well as the volunteers and every audience member for their contribution to the festival’s success. Casteliers also wishes to thank the federal, provincial and municipal governments, as well as the Institut français and the French Consulate General in Québec City for their valuable support. We also wish to acknowledge the official presenter of this 14th edition of Festival Casteliers, Caisse Desjardins des Versants du mont Royal. Happy Spring from all of us at Casteliers. for Festival de Casteliers’ 15th anniversary celebrations!